People in the Horn of Africa, especially Somalia, are starving in their millions due to a famine and the failure of developed country governments and people to donate enough money for food aid to feed them (1) – (2). The famine has five main causes – the worst drought in 60 years (possibly worsened worsened by climate change), civil war (lengthened by US and Ethiopian involvement), wealthy Africans and foreign investors buying up land and water for commercial farming, overpopulation; and some factions in the anti-American side in the civil war – Al Shabab –who target aid workers or refuse to let them in. 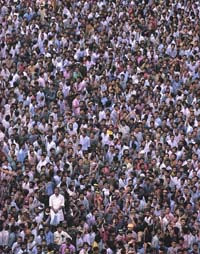 Overpopulation is far from the only cause and would require increased aid (with very different conditions on it) to reverse it, not the end of aid which many are wrongly advocating. Those who claim ‘foreign aid hasn’t worked’ as an excuse for not donating this time are confusing long-term development aid with emergency humanitarian aid for famine victims, which definitely saves lives. Those who blame Somalians might as well be saying cancer victims must have done something wrong to deserve it (especially to starving children). Foreign aid has failed to produce enough development from the 1980s on because donor governments, the IMF and the World Bank have only given it on conditions that prevent development. It’s been based on a myth that developed countries became developed through total free trade, which has been used to make aid conditional on complete free trade policies by developing countries. In fact development economist Ha Joon Chang in his book ‘Bad Samaritans’ has shown that all developed countries developed their industries through government intervention, subsidies and protection – and that’s the only way developing countries can develop (3). The idea that humanitarian aid organisations like the UN’s World Food Programme have failed, or that aid and development charities like Oxfam have failed, is simply false though. Their emergency aid has saved lives and so has their development aid, but the latter is not on a large enough scale to produce major economic development in the absence of similar government aid and fair trade. Otherwise read on for more details on the causes of the famine and solutions – the donation links and others are repeated at the end. The most immediate cause is the worst drought in 60 years in the Horn of Africa (4) While there have been droughts in the Horn of Africa for centuries, their frequency has increased from a 10 year cycle to a 5 year one and then recently to one every 2 to 3 years (5). Climate change caused by developed world CO2 emissions can’t be ruled out as one of the causes. The US Geological Survey predicted in January that droughts in East Africa would be more likely due to rising global temperatures, while climate scientists are coming to a concensus that extreme weather events have become so extreme and common that the link with climate change must be investigated (6) – (7). Equally important as an immediate cause is the decades long civil war (kept going by the US government’s backing for warlords they say are fighting against others they allege are allied to Al Qa’ida, under both Bush and Obama ; and by a US backed Ethiopian invasion from 2007 to 2009, which re-started the civil war after it had briefly ended in late 2006 ) . This is less straightforward than it sounds as some of the warlords previously identified as the worst in by the US in the past are now being supported by it. 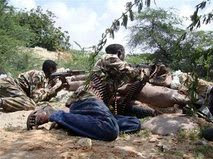 Ethiopian soldiers who have been at war with Somalia many times due to a dispute over who owns the Ogaden region , slit Somalian villagers’ throats “like goats”, stabbed out teenagers’ eyes with bayonets and committed many rapes. The Ethiopian invasion (now ended) and US air and drone strikes targeting Al Shabab and Al Qa’ida leaders across the country, along with CIA detention and torture centers in Mogadishu, have increased support for the Al Shabab rebels (8) – (20). The war is definitely a primary cause of the famine - the worst famines in the region in the past came during the heaviest fighting in civil and international wars (21). Third is Al Shabab – the allegedly Al Qa’ida supporting side which the US opposes in the civil war, some of whom have said they’ve lifted their previous ban on western aid agencies operating in their territory (and killings of aid workers), while others say it will continue and deny there’s a famine. 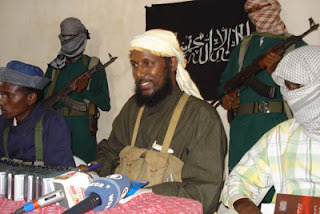 This seems to be bechttp://www.blogger.com/img/blank.gifause Al Shabab is more a loose alliance of groups than a single organisation (22) – (24). This does not mean it will be impossible to get aid through. Some Shabab factions are letting aid in (25). The Al Shabab ban only applied to four foreign aid agencies – Care, the UN Development Programme, the UN’s World Food Programme and the International Medical Corps (26). Some villages and areas supposedly under Al Shabab control are letting aid agencies in. Some towns and villages in areas where Al Shabab factions have refused to let foreign aid in are also changing sides in order to get aid for their people (27) – (28). 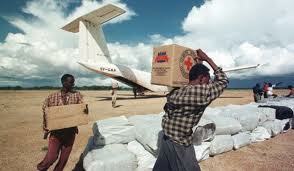 Many aid organisations, like the World Food Programme, were already delivering aid through local Somalian charities (29). The factions among Al Shabab refusing to allow aid in are not an unprecedented problem. There have been problems of looting by criminal gunmen and pirates for decades (30). There have been many false claims made by extreme right bloggers like Pamela Geller (of the US Tea Party Republican faction) that UN aid money has gone to Al Shabab. In fact UN food and medical aid has been given to Al Shabab drought committees to distribute in some areas where it’s the only way to get aid to the people (32) – (33). The reliability of Geller’s claims can be judged by some of her other blog posts in which she for instance implied that the Norway terrorist shootings committed by Anders Behring Breivik were the result of an Islamist ‘Jihad’ and that all rapes in the past 5 years in Norway had been committed by Muslims (34). Fourth, a major long term cause is land previously available for nomadic grazing being taken over for commercial farming for profit, much of it bought up by foreign firms and governments (35) – (38). A large proportion of the population of Kenya, Somalia and Ethiopia have survived for centuries (and probably thousands of years) as nomadic pastoralists or herders, with small flocks of goats and cattle (and more recently camels). In the past they survived periodic droughts by constantly moving their herds to where there was water and grazing, often across borders between modern countries (39). However a wealthy minority of Africans and Big American, European and Chinese hedge funds and firms Saudi sheikhs and companies have been buying up large amounts of land in Africa (including Kenya and Ethiopia) for commercial agriculture for profit, much of it in the river valleys and estuaries the herders moved to during droughts in the past (40). This is partly because much of the Middle East and the desert states of the US such as California, Texas and Arizona (along with Florida) have depleted their acquifers and are running out of water and having to import more food – and partly because foreign investors see profits to be made from producing food as prices rise due to population growth and land previously used for farming becoming desert or being used for bio-fuels (41) – (46). Overpopulation in sub-Saharan Africa is a serious problem and caused largely by high birth rates, but it’s a problem which can only be solved by development. That development can only be brought about by increasing aid (and changing the conditions on it) to provide education, contraception, development, healthcare and unemployment benefit. That development has to be combined with fairer trade – meaning allowing African countries to protect their industries more than reducing limits on exports to the developed world. This is because high birth rates are as much a symptom of poverty and lack of development as a cause of it. The poorest countries have a high infant mortality rate ( over 20 times as many children die before reaching their teens in Somalia as in the UK) and low life expectancy (average life expectancy in Somalia is 48 compared to 79 in the UK), both problems caused by food shortages and lack of clean water and healthcare, as well as inequality and poverty. On top of this in countries with little or no welfare state the only way people in poverty can ensure they’ll be looked after if they become too ill or old to work or to farm their own land or look after their herd is to have enough children to do it. Since many will die as infants or adults, that means having more children. The United Nations Population Fund has found that the poorest 20% of the population in developing countries has double the birth rate of the wealthiest 20% (53). Even taking into account high infant mortality rates and low life expectancy population is still rising too fast due to high birth rates though, leading to shortages of clean water, food and jobs (54). Other contributing causes include traditions of having big families to honour ancestors or for the prestige of the family or clan, low social status of women, lack of education and being unable to get access to contraceptives (55). Urbanisation is reducing birth rates by changing social norms and the status of women and giving women access to contraception and family planning (56) – (57). Birth rates in Africa have also been falling rapidly due to higher income and education levels in towns and cities, though they seem to have stopped falling in the last few years in Kenya and in Ethiopia (58). Birth rates only fell in the developed countries after people became wealthier, less dependent on agriculture and less dependent on human labour for it (due to mechanisation), urbanised (as industries other than agriculture developed, providing more employment in cities) and provided government funded education, healthcare and welfare for unemployment ,sickness, disability and pensions. 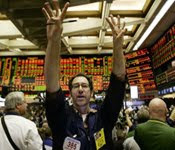 The same has happened in the urban areas in some African countries, in towns and cities which have seen economic growth. The effects have been limited by overall economic decline in African countries from the 1980s on and the lack of government support – and remain higher in rural areas. There is a strong negative correlation between literacy rates and birth rates (i.e the more people in a country can read and write the fewer children they have per adult), suggesting providing funding for education could be effective in reducing over-population. Some UN experts say population in some parts of Kenya has doubled in the past decade (though herd sizes remain unchanged (59). The fact that herd sizes have not increased makes it unlikely that over-grazing has caused the drought, though human over-population means more people have less to live on. Those claiming the famine is Somalians and Kenyans’ own fault as they should use contraception and become more educated to reduce birth rates also ignore the fact that condoms cost money, as does education. 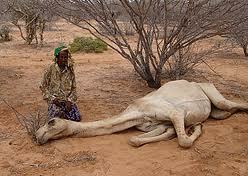 If they demand Somalis and Kenyans use contraception they need to donate more money to provide for this. Development – in terms of economy, education and public services and welfare – is strongly correlated with falling birth rates, just as lower birth rates make development easier and higher ones make it harder. As UNFPA say though, lower birth rates do not guarantee development. This requires ending harmful absolute free trade conditions on aid, such as demands for privatisation of state industries and public services, welfare cuts and abolition of tariffs and other protections. 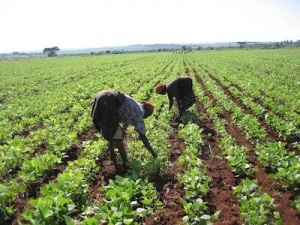 Even if all restrictions on trade between Africa and the developed world were abolished tomorrow African traders, farmers and businesses could not compete with companies and industries built up over centuries by protection and subsidy till they were world leaders. It would also be a levelling down process to African standards of living for the majority rather than a levelling up of African standards of living. That’s why allowing Africa to protect its farmers and industries and set up free trade areas only with countries at a similar level of development is better than total free trade. Despite all this, both governments and people in developed countries are failing to donate enough money for emergency food aid and many people are even calling for the starving to be left to starve as part of their ideological crusade against all foreign aid or a mistaken belief that they are being conned as they’ve given to famine relief for Somalia in the past and are being asked to again now (see e.g comments on this Independent newspaper article). This has to change and change now. Whatever your views on development aid this is emergency aid which has to be delivered now to keep millions alive long enough for longer term solutions to be put in place. There is a lot wrong with many governments’ and IMF and World Bank aid programmes and they need reformed, but pretending that Africans would be better off if we provided them with no foreign aid at all is the real con trick. Some people are conning themselves into believing what they want to believe, so they don’t have to feel any guilt for letting millions of adults and children starve, rather than contribute a small fraction of their own income and taxes to saving their lives. The causes of the drought and civil war need to be addressed, but we can’t leave millions of people to die while we address them. They need emergency humanitarian food and water aid now – we know from past crises this will save lives. If you’re in the UK you can donate to the Disasters Emergency Committee (an umbrella group of all the major aid agencies and charities) donate in the UK to the Disasters Emergency Committee on this link . You can also contact your MP or members of congress and the ministry that deals with foreign aid in your country (e.g US Aid in the US or the Department for International Development in the UK) to ask them to donate more to the UN’s East Africa famine appeal and/or to ask them to increase foreign aid to the poorest countries ; and ensure any contracts funded with foreign aid go to companies based in the recipient country rather than the donor country wherever possible – and to recommend they read Ha Joon Chang’s book ‘Bad Samaritans’ and adopt aid policies that permit poorer countries to protect and subsidise their economy and public services from foreign competition so they can develop. You ever spend any time actually working in Somalia? I did (one year) and another year in Ethiopia's Ogaden region. The reason Africa has so many problems is because Africans do not have solid socio-political systems for community ownership and that feeds on a host of other development issues. The problems of the poor are not caused by the rich, as this article insinuates. That's just not true. No i haven't, but working in a country for a year does not guarantee you understand the causes of all it's problems. If it did every man in a pub in the UK saying "the problem with this country is..." would be right and they would all agree. Could explain the meaning of "solid socio-political systems for community ownership"? How much "community ownership" of anything is there in the developed world? Not much that i can see. Councils have been selling off much of what public land there was in the UK to Tescos and other developers. Or by "community ownership" are you just using jargon which is nothing to do with actual ownership? What are some of this "host of other development issues"? Many of the problems of the poorest are caused by the richest and most powerful (huge wealth being one form of power as it buys political influence) - which is why, as Ha Joon Chang's book shows using many examples, foreign development aid to African countries have so many conditions attached to them which prevent them protecting and building up industries which could compete with multinationals based in the developed countries. A few years back British foriegn aid was funding privatisation of water in South Africa, resulting in profits for British water companies along with the poorest (who aid is suppoed to help) having their piped water cut off as they couldn't afford it - and cholera killing many of them in an epidemic. You asked a question whether people should give food aid to the starving people in Africa and the short answer is yes as a humanitarian point of view but the real economic solution is that the West should help them establish a population Control policy but they have never done so unfortunately. The birth rate is too high, but the worst famines in Somalia have always been during the worst fighting in the civil war. High birth rates are also more a symptom of lack of development than a cause of it. If you look at any developed country the birth rate fell after people got better off and there was a welfare state and publicly funded education. The root cause of poverty, hunger and high birth rates is lack of development. Allow development by stopping developed world governments and the IMF and World Bank from forcing developing countries to open up their markets entirely to first world exports they can't compete with and development will happen and with it poverty and hunger will be reduced and birth rates will fall.